It used to be that two laptops, sitting side by side, couldn't communicate with each other; they may as well have been a thousand miles apart. But that was then, before the advent of Zero Configuration Networking technology. This amazing cross-platform open source technology automatically connects electronic devices on a network, allowing them to interoperate seamlessly-without any user configuration. So now you don't have to lift a finger! Needless to say, it has completely changed the way people connect to devices and programs for printing, file sharing, and other activities. 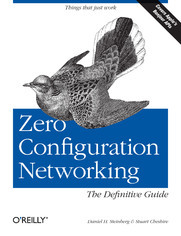 Zero Configuration Networking: The Definitive Guide walks you through this groundbreaking network technology, with a complete description of the protocols and ways to implement network-aware applications and devices. Written by two Zero Configuration Networking experts, including one of Apple's own computer scientists, the book covers more than just file sharing and printing. Zero Configuration Networking also enables activities such as music and photo sharing and automatic buddy discovery on Instant Messaging applications. In fact, Zero Configuration Networking can be used for virtually any device that can be controlled by a computer. And this handy guide has the inside scoop on all of its capabilities-and how you can easily apply them in your own environment. For the technically advanced, Zero Configuration Networking: The Definitive Guide examines the three core technologies that make up Zero Configuration Networking: Link-Local Addressing, Multicast DNS, and DNS Service Discovery. It also reviews a series of APIs, including C-API, Java API, CFNetServices, and Cocoa's NSNetServices. Whether you want to understand how iTunes works, or you want to network a series of laptops and other devices at your office for maximum efficiency, you'll find all the answers in this authoritative guide.